Answering behavioral or scenario-based questions during an interview can be tricky, but it is important to be prepared in order to land your dream IT job. Read on, as we give you tips and tricks on how to answer our next set of the most frequently asked technical interview questions. We gave you tips on the best answers for some of the most frequently asked behavioral tech questions in Part 1. If you haven’t checked it yet, click here. Interviewers ask this question to assess your experience with a certain programming language. They want to understand how comfortable you are with this specific language. In most cases, they are not looking for a high-level specialist. However, they are looking for your level of understanding, depth, and some examples of complex development projects. Be concise, do not ramble and provide context. 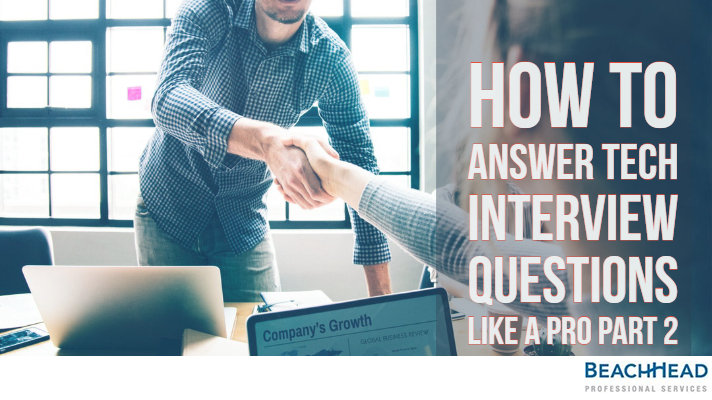 We recommend that you speak no more than two minutes, and then ask if you have provided enough information or would the interviewer like more depth. If you do not have a lot of experience with the specified programming language, we recommend that you provide an honest answer, even if you mention it is academic experience, and provide the interviewer of an example where you were challenged to learn a technical skill quickly and were successful. The trick is to be confident and show you have the ability to move from one language to the other, highlighting your skills. The managers want to know how well you know the language you have worked on and how comfortable are you in learning new things. Remember, the tech industry is highly dynamic with new languages replacing the old ones all the time. Remember, to show your positive attitude towards change. With this question, the hiring managers want to have an idea about how the candidate puts his skills into action. They look for practical application of technical skills and knowledge, technical expertise and the ability to use the same for problem-solving in a logical manner. The trick here is to talk about a problem that you have genuinely worked upon in the past. Start by explaining the nature of the issue, the troubleshooting process and how you resolved it. You can go ahead and explain the impact this had on the organization and its processes in the long term. Remember to be honest and do not exaggerate the situation to make it look what it was not. Programming challenges are very common in technical interviews. For some roles, these happen during the second or third round, but most of the times it can happen when you first meet the hiring manager. In some cases, managers tell you to write coding on paper. While in other interviews, they may ask you to you write a test in front of a computer and give you a problem to solve. They can also ask you to walk them through the entire thought process. Some tests have time limits and some provide longer periods to ponder more complex problems. One thing to keep in mind here is that getting the correct answer matters, however focusing on the right approach towards solving the problem matters just as much. The best way to ace these questions is to practice, practice, and more practice. So, get your coding game up and practice as much as possible before your next interview. There you go! Making mistakes in an interview isn’t rare. It happens. The truth is that it is okay to stumble a little to find the right answer or to botch up a question. Your attitude, confidence, personality, and honesty will make up for any mistakes in an interview. The key is presenting your strengths, and your skills through strong preparation to deliver the interview performance of a lifetime; every time and then the next time. Prepared for your interview? We can help you set it up for your next job. Send us your resume at info@beach-head.com and we will help. Remember to like us on Facebook and do follow us on Twitter and LinkedIn. Apply to all our latest job openings here.